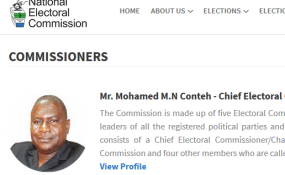 Mohamed N'Fa Allie Conteh on the election commission's website. Mr Mohamed N'Fa Allie Conteh is accused by the main opposition All People's Congress (APC) and the National Grand Coalition of 'incompetence and impartiality'. They say his handling of elections is a threat to national peace and stability. The calls come in the wake of a controversial by-election early this month which the opposition parties believe was rigged in favour of the governing Sierra Leone People's Party (SLPP). President Bio's SLPP defeated the APC in that election in March last year pulling the curtain on its decade in power. APC is yet to officially accept the results. APC said Wednesday it had lost faith, trust and confidence in the NEC under Chairman Conteh, whom it described as "incompetent, impartial" and lacking in credibility to conduct any future elections. It warned that such a situation poses threat to national unity, security and stability. "The evidence against NEC is compelling and we do not believe that we should allow Mr Mohamed N'Fa Allie Conteh to drag this beloved country down the path of chaos and anarchy. The APC has admonished Mr Mohamed N'Fa Allie Conteh to resign with immediate effect so that our revered democratic gains in this country can proceed unhindered," the statement signed by the party's National Secretary General, Ousman Foday Yansaneh said. NGC, whose candidate came third in last year's presidential election, said separately the poll was marred by malpractice.